We have the experience to know when wasp removal is necessary and beneficial. American Pelecinid Wasp- The good news is that this wasp doesn’t sting, but it is intimidating in appearance, resembling a scorpion with its excessively long abdomen. Blue-Winged Wasp- This is actually a beneficial wasp, as it feeds on Japanese beetles, which are destructive in your garden. It can sting as a defensive reaction, but is not overly aggressive. Braconid Wasp- No worries about this one, as it has only a tube for depositing eggs– no stinger! Cicada Killer Wasp- Sometimes these are very aggressive and sometimes they aren’t, so it is best to proceed with wasp removal. Common Thread Waisted Wasp- This wasp is very dangerous, but only to its prey, as it is not known to be aggressive toward people. It is, however, beneficial for gardeners, as its favorite prey is plant-consuming caterpillars. Cuckoo Wasp- A most unique wasp, as it is more likely to curl up when threatened than to pose a danger. 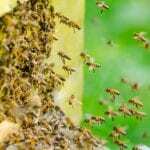 It is, however, a danger to other bee and wasp species, so you may want to call for wasp removal to protect beneficial bees. Five-Banded Thynnid Wasp- This is a highly beneficial wasp, as it preys on beetles that destroy flowers and trees while posing no danger to humans, as they are solitary wasps and the male can’t even sting. Four-Toothed Mason Wasp- Although sometimes mistaken as a hornet, this is a beneficial wasp that kills leaf-rolling caterpillars. They do not behave aggressively. Northern Paper Wasp- What is unique about this species is that the queen is the first to aggressively attack, and then her oldest workers join in the battle. Although they are effective at pest control, their aggressive nature makes them a hazard to have in your yard. Spider Wasp- This one is going to give you pause when deciding about whether to proceed with wasp removal, particularly if you hate spiders. They hunt them! Unfortunately, a nesting female will deliver a painful sting if you disturb her. Red-and-Black Mason Wasp- While this wasp can defend itself, it usually only does so if mishandled, and since it leads a solitary life, you are in no danger of a large number attacking at once. It is, however, an extremely beneficial wasp to have in your garden as it collects caterpillars and beetle larvae that you don’t want. As you can see, there are many wasp species that pose no issue and can be quite beneficial. It takes a trained professional to know the difference and to be able to provide the wasp removal services you need for those that are creating a problem. Count on us to resolve a dangerous issue of aggressive wasps with products that are safe for you, your family, and your pets.